To read the guest opinion in today's Spokesman Review, you'd think that coal trains are relatively harmless and are the next best thing to Christmas. Greater Spokane Incorporated supports federally regulated interstate commerce and international trade, and is a member of the Alliance for Northwest Jobs and Exports. The Alliance supports the construction of the Gateway Pacific Terminal, which will be undergoing an environmental impact study that – when finalized – will have incorporated all public and agency comments and proposed mitigation. The Gateway Pacific Terminal would create an estimated 3,500 to 4,400 new jobs during construction, and 300-400 permanent family wage jobs that will generate an estimated $74 million to $92 million in state and local revenues. 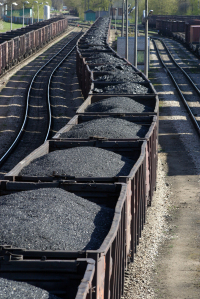 Along with the contribution that burning the coal will make towards accelerating climate change, the concern in Spokane is about people being exposed to the increased amount of diesel exhaust and coal dust from sixty 1 to 1-1/2 mile-long trains each day. Last June, the city council passed a resolution expressing their concern and asking that one of the environmental impact hearings be held here. As it happens, a hearing is being held this Tuesday from 4-7 pm, at the Spokane County Fairgrounds Plaza. Got something to say? Show up and say it. Got something to say? Then don't vote for Democrats and Republicans and their "clean coal" nonsense. The last election approved coal, global warming, and the trade deals that gut environmental regulations. If you voted for Democrats or Republicans in the last election, don't go to some fake meeting and pose as an opponent to coal. These trains are your trains. People should assume that the US government, the railroads, the coal companies, and China will use the hearings to identify opponents to the trains and retaliate against us. Obama's violence against Occupy will likely pale next to the combined violence of these forces to protect their profits. If you listen closely to local officials, they have already conceded on coal delivery, resolution or not. This is a national issue, and the Chinese government and international corporations have purchased the loyalty of both major parties and the top politicians within them. Track the source of the wealth Bill and Hillary Clinton have boasted to see what I mean. Don't expect the Secretary of State to lodge any protests if the Chinese take a sudden interest in Spokane's local politics. The full force of the US government is already behind the trains. A better strategy than mass attendance would be to choose a single brave spokesman to represent Spokane citizen interests against those of the governments/corporations. I'd suggest a tribal elder. If you do go, bring a lawyer. Wear a mask. Cover your license plate. Turn off the cell. We have a President who claims he can surveil you, defame you, indefinitely detain you, and kill you without due process. (Sure he's cute, but then again, so was Ted Bundy.) We have industries with long histories of the use of violence against citizens, particularly here in the Northwest. We have a political system corrupted by a foreign dictatorship and international capital. Check out how the Chinese government treated Tibetans who opposed railroad policy there. This ain't no simple tree-hugger issue. We're going to lose on coal, and Keystone, and fracking, because we no longer have a representative government, and the vested interests are simply too powerful. The one issue we may win is better crossings in the Valley, since the two railroad companies are at odds on this issue, some local elites are also personally affected, and long trains negatively affect roadway shipping and other corporate costs. Crossings are the only issue in political play here. Yeah, Obama. He makes the trains run on time. Except Amtrak. I suppose Amtrak will have even more delays, since it runs on the coal tracks. It already averages hours off schedule. Coal will be the end of the Empire Builder. China gets the economic growth, we get the 19th century. In 2008 the Democrats promised high speed rail to Seattle. Instead, they gave us endless coal trains to China, the North Corridor and a bloated GM, and the death of what's left of passenger rail. So much for science-based policy toward global warming. I actually look forward to the Inland Empire's new status as a third world exporter of raw materials. Berkeley can send anthropologists to study our naive spirituality and quaint folkways. The New York Times can send travel writers to write about our colorful festivals, spicy foods, and red hot bargains. Hillary will lament the poverty of our women! Bill will bear hug our school girls! Jimmy Carter will build little houses! Bain Capital will give us jobs for 15 cents on the dollar! And Wen Jiabao will promise us democratic reform. But only if we're really, really, really good.